Omaha hold ’em (or Omaha holdem or simply Omaha) is a community card poker game (“flop game”) similar to Texas hold ’em, where each player is dealt four cards and must make his best hand using exactly two of them, plus exactly three of the five community cards. In North American casinos, the unadorned term “Omaha” can refer to several games. Typically, it refers to the high-low split variant played with fixed limits: also called “Omaha eight-or-better”, “Omaha Hi-Lo”, “Omaha/8” and several other similar names. The original game is more commonly known as “Omaha High Only”. In Europe, “Omaha” still typically refers to the high version of the game, usually played pot limit. Pot Limit Omaha is often abbreviated as “PLO”. Pot-limit and no-limit Omaha eight-or-better can be found in some casinos and online, though no-limit is more rare. It is often said that Omaha is a game of the ‘nuts’, i.e. the best possible high or low hand, because it frequently takes “the nuts” to win a showdown. It is also a game where between the cards in his hand and the community cards a player may have drawing possibilities to multiple different types of holdings. 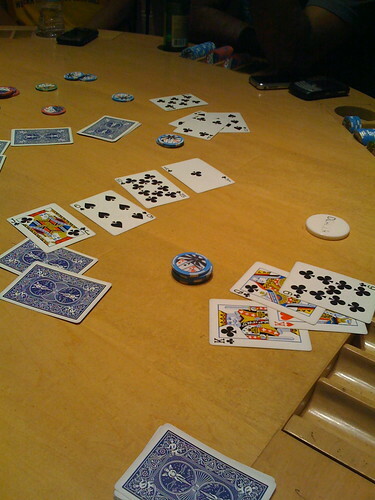 For example, a player may have both a draw to a flush and a full house using different combinations of cards. At times, the players themselves have trouble figuring out what draws and possibilities that their cards hold. The basic differences between Omaha and Texas hold ’em are these: first, each player is dealt four cards to his private hand instead of two. The betting rounds and layout of community cards are identical. At showdown, each player’s hand is the best five-card hand he can make from exactly three of the five cards on the board, plus exactly two of his own cards. Unlike Texas hold ’em, a player cannot play only one of his cards with four of the board, nor can he play the board, nor play three from his hand and two from the board, or any other combination. Each player must play exactly two of his own cards with exactly three of the community cards. As in Texas hold ’em, three or more suited cards on the board makes a flush possible, but unlike that game a player always needs two of that suit in his hand to play a flush. For example, with a board of K♠ 9♠ Q♠ Q♥ 5♠, a player with A♠ 2♥ 4♥ 5♣ cannot play a flush using his ace as he could in Texas hold ’em; he must play two cards from his hand and only three from the board. A player with 2♠ 3♠ K♦ Q♦ can play the spade flush. Two pair on the board does not make a full house for anyone with a single matching card as it does in Texas hold ’em. For example, with a board of J♠ J♦ 9♦ 5♥ 9♣, a hand of A♠ 2♠ J♥ K♦ cannot play a full house; he can only use his A-J to play J♠ J♥ J♦ A♠ 9♣, since must play only three of the board cards. A player with 2♣ 5♣ 9♠ 10♠ can use his 9-5 to play the full house 9♠ 9♣ 9♦ 5♥ 5♣. Likewise, with three of a kind on the board, a player must have a pair in his hand to make a full house. For example, with a board of J♠ J♦ A♦ J♥ K♣, a player with A♠ 2♠ 3♥ K♦ does not have a full house, he only has three Jacks with an Ace-King kicker, and will lose to a player with only a pair of deuces. This is probably the most frequently misread hand in Omaha. (Naturally, a person with the fourth jack in his hand can make four Jacks because any other card in his hand can act as the fifth card, or “kicker”). Sometimes the high-low split game is played with a 9-high qualifier instead of 8-high. It can also be played with five cards dealt to each player instead of four. In that case, the same rules for making a hand apply: exactly two from the player’s hand, and exactly three from the board. In the game of Courcheval, popular in Europe, instead of betting on the initial four cards and then flopping three community cards for the second round, the first community card is dealt before the first betting round, so that each player has four private cards and the single community card on his first bet. Then two more community cards are dealt, and play proceeds exactly as in Omaha.